People say the most exciting part of getting lost at one place is the possibility of encountering unexpected new world and of course meeting people we never plan to meet. 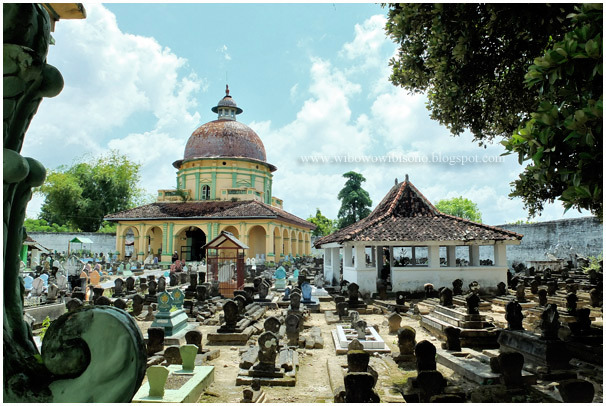 On a long weekend which fell on May this year, I decided to let myself lost in Sumenep, one of four regencies in the island of Madura, East Java Province. Together with Jamal, a friend from work, I spent two days exploring its small town which was rich with history of the past, where the sultans used to rule the regency from a palace and a Chinese architect designed a grand mosque that still exists today. All pictures below were taken with Fujifilm X10. Thank you for coming. As someone addicted to riding inter province bus, Jamal would surely prefer taking a bus from Jakarta to Sumenep. But with the short holiday we had, that long hour ride would definitely waste our time. So we both agreed to take a night train from Jakarta to Surabaya and then take a bus to cross the Strait of Madura on the following morning. It took thirteen hours to reach Surabaya by train and another five to reach Sumenep by bus. We were fortunate to get a low rate hotel in the heart of the town. Staying there made us possible to reach two historical sites by foot. Since we didn’t plan this trip very well, we counted on the google map in our android devices to decide where to go. 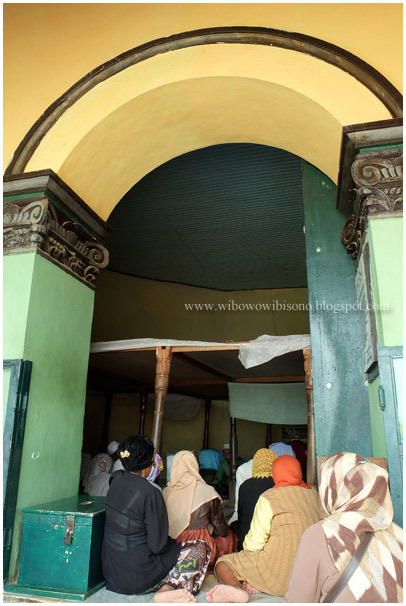 We learnt that the nearest place was the old grand mosque of Masjid Jami. 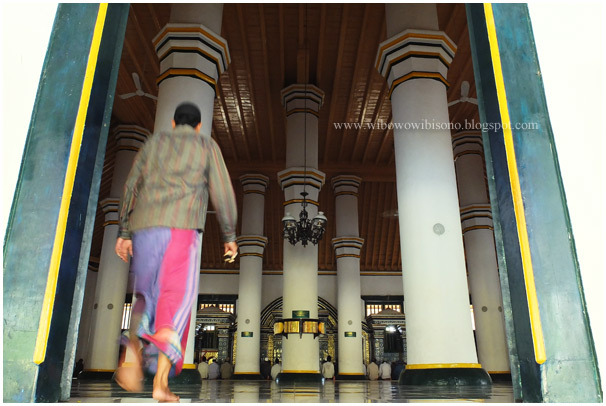 I had seen this mosque many years before in the news paper. Being finally able to see it with my eyes was like a dream came true. 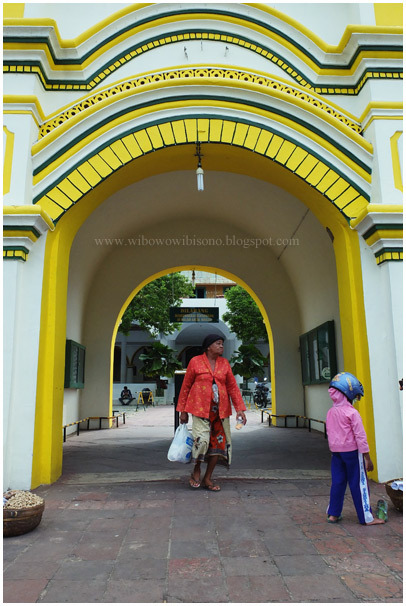 The gate of the mosque was perceivable as Chinese architecture by many people. 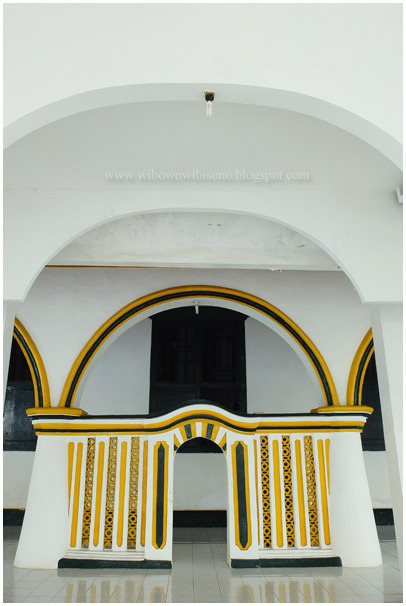 But with the arched doors in it, I perceived it a little bit Arabic. Walking through the gate, I realized that this was not just a today’s ordinary free standing wall. It was a thick wall that more appeared to be like a fort. Right in the middle of the entrance there was a square box with a tiny void on its top, where people could drop money in it as alms. 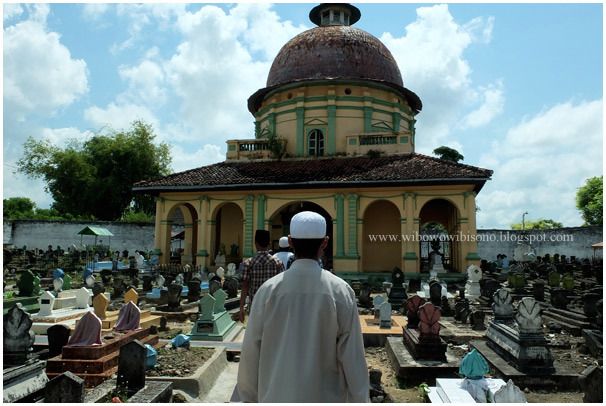 From a reference I had found on the internet, this mosque was designed by a Chinese architect, Lauw Pia Ngo by the order of Panembahan Somala, a Sultan reigning at that time, in 1779. The project was completed in 1787. I walked closer to the mosque, tried to find the Chinese touch in the design. The easiest way would be surely staring at the details and ornaments. 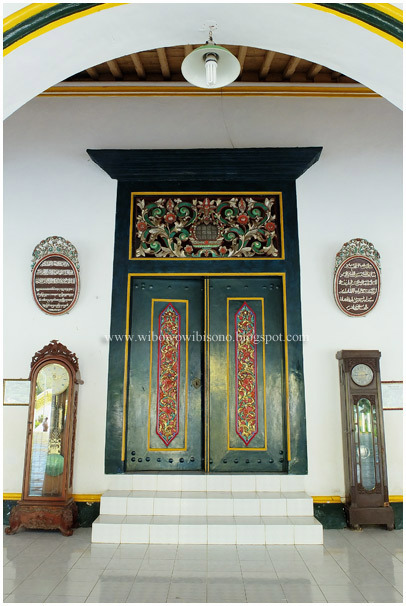 Instead of finding the Chinese touch, I found doors that reminded me so much of 18th century Dutch architecture I had seen in Jakarta and Semarang. I guessed there was a possibility that Lauw Pia Ngo learnt architecture and engineering from the Dutch. 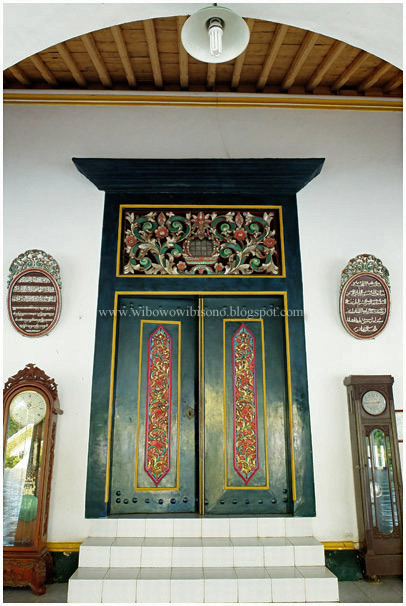 Finally, I found the Chinese touch at the colorful ornaments of carved wood placed at the door leaves. The same ornaments could be found at many Chinese temples in Java. Beside the carved wood, the vertical bars at each window and some ornaments also said that the mosque was designed with a Chinese touch. I was curious to see the interior of the mosque. 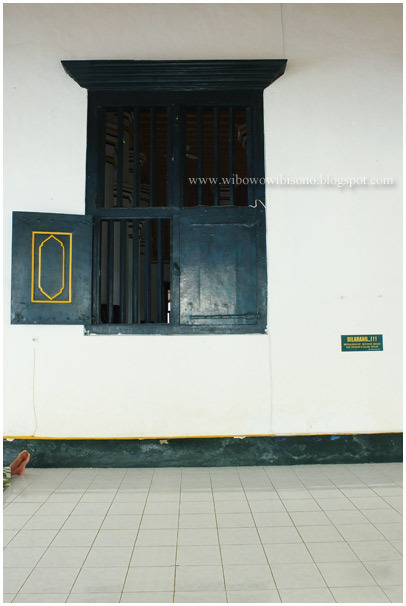 But before I stepped in, I thought it would be much better if I went to meet the caretaker and saw whether I was allowed to take pictures inside the mosque. It didn’t take long and complicated procedures to obtain permission. All I got to do was writing down my name and address in the guest book. Guided by one caretaker whose name I didn’t remember, I was free to wander in the very spacious hall inside the mosque. Not like many old Javanese mosques in common that have four major columns to support its roof, this mosque had thirteen major columns. I was mostly attracted by the blue ceramics adorning the pulpits. According to the caretaker, those ceramics were brought from China. Each of them had different patterns symbolizing the ninety nine names of God the almighty. 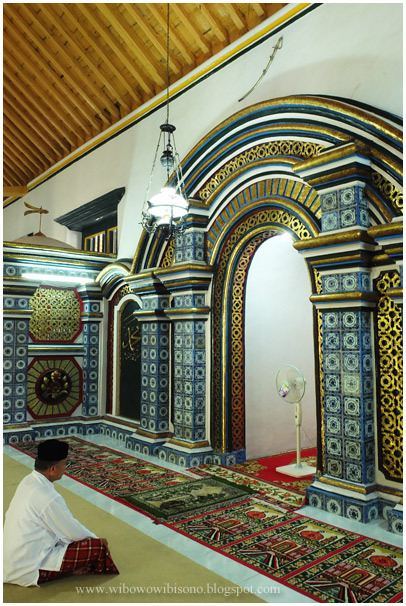 What to me looked awkward was a silver sword hanged on the wall right above the mihrab, a semicircular niche on the wall indicating the direction to Mecca. In my sense, there were supposed to be two swords on that wall. Where was the other one? My sense was right. There used to be two swords, but one of those had been stolen several years before. The remained sword was once stolen too, but the thief decided to return it to the mosque as he couldn’t bear the mystical terror the sword revealed. I know it doesn’t make any sense but that sort of things happen a lot here in Java. Walking out from the main hall, the caretaker led us to the front gate, which I said, appeared to be like a fort as it had a thick wall. To reach its top, we had to walk upstairs. 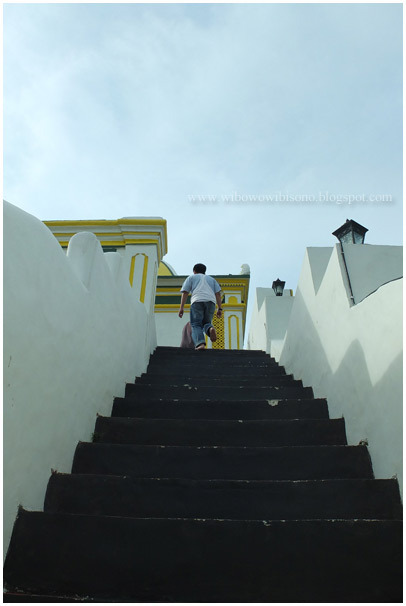 I didn’t think Lauw Pia Ngo comprehended the concept of ergonomic very well as each step of the stairs was above twenty centimeters height. On the top we saw a structure that housed a huge old drum made of wood and leather. It was from the 18th century, said the caretaker. 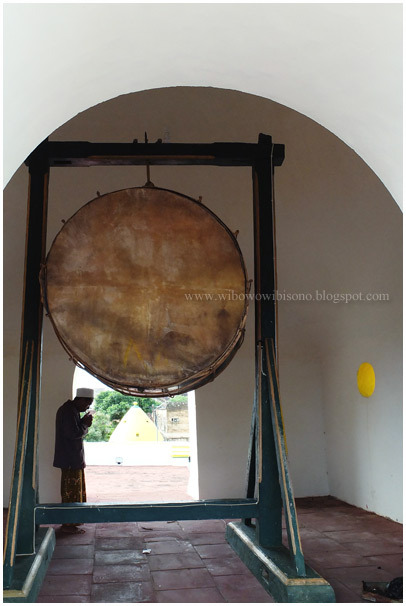 I was glad that it was not sacred and no matter how old and significance the drum was, people didn’t put offerings around like I had seen in many sacred places in Java. In fact, I was free to touch and beat the drum with my hand. 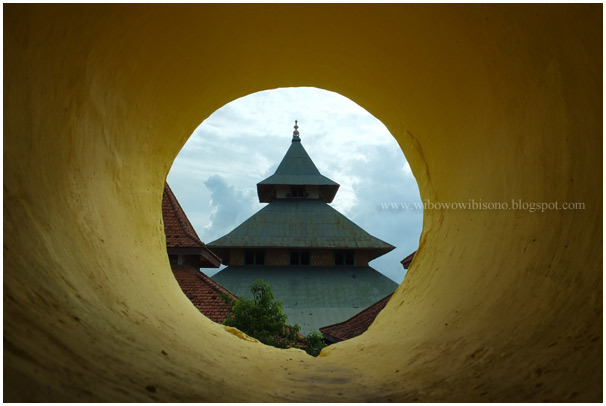 Still from the top, I could see clearly the shape of the main roof of the mosque through a circle hole of the wall. You can sense how thick the wall is. 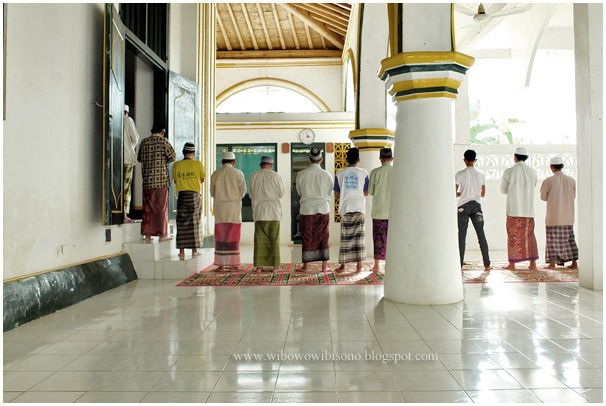 As we walked downstairs, the adzan – the call to prayer – was recited by muezzin. It was time for afternoon prayer. 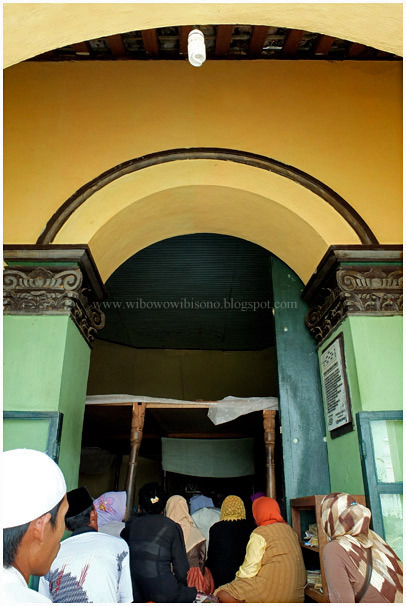 I was amazed by how people suddenly came from many directions to the mosque as if to answer the call. They came by foot, with motorcycles, bicycles, and even cars. Another amazing thing that I saw in this mosque was how people persisted in standing in the front line while doing the prayer, even if they had to pray outside the main hall. Well, my amazement didn’t stop right there. 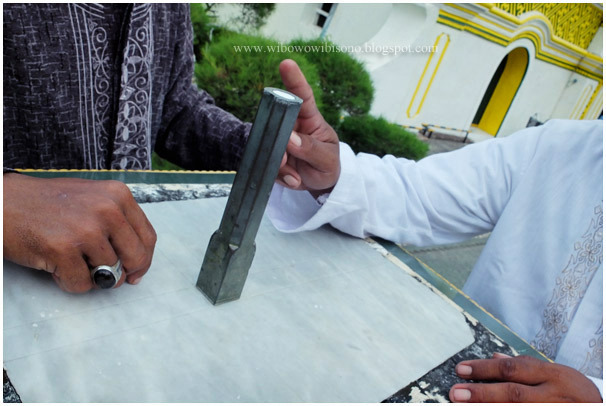 In the front yard of the mosque, there was a small sundial made of iron. In the past, people counted on it to determine the time of noon prayer, simply by watching the shadow that fell on the white marble. The shadow should align with the line that faced the west. 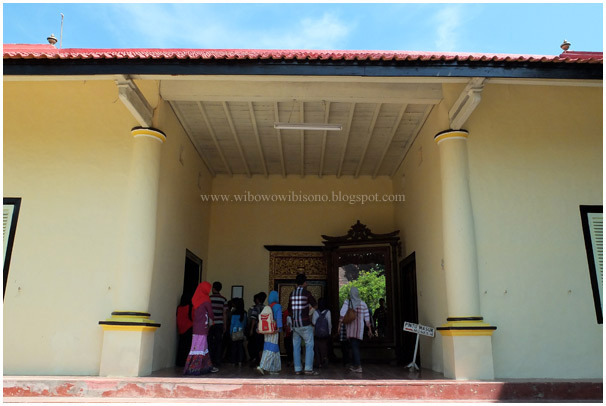 The mosque was actually built to compliment the Kraton, the sultan's palace. It was no wonder that both objects were located close to each other. To reach the palace, we just had to walk across the town square, head to the east. We thought the palace was already closed for public at that time, so we decided to go to the old port and try to find a car to rent. Unfortunately, we couldn't find a car rental. Apparently it was not a promising business in Sumenep. Most tourists coming to the island of Madura rent the cars in Surabaya, the nearest big city. So we ended up renting a private car belonged to someone we met at a kiosk selling pulse for cellular phone. It was unbelievable that we, a total stranger in the island, could rent the car for 24 hours, simply by just handing my ID card to the owner. We were even allowed to pay the rent at the following day. Since it was too late to go anywhere in Sumenep, we insanely thought of leaving the island, crossing the strait of Madura to have dinner with our colleagues who spent the long weekend in Surabaya. It took us about five hours to drive from Sumenep to Surabaya, and another six to return to Sumenep. We didn't stay overnight at the hotel as we got there at six in the morning. I slept for a while in our room before Jamal woke me up at eight to start exploring Sumenep again. 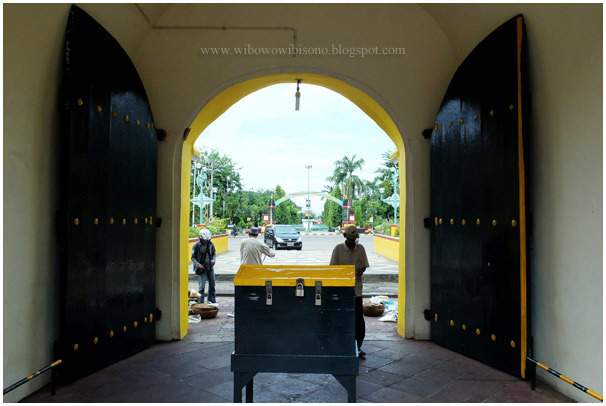 This time, we went straight to the sultan's palace. 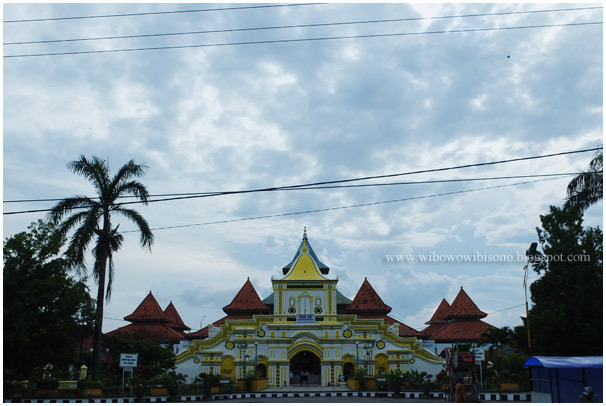 Like many other old palaces in Java, this one has also become a museum. Only small part of it remains the residence of the sultan's family. Due to the lack of space to house its collections, the museum occupies two different buildings. One across the palace and the other one inside the palace complex. Everyone visiting the place is directed to the first building across the complex. We were soon recognized as a non local tourist by the woman in the ticket counter who later became our tour guide in the museum. 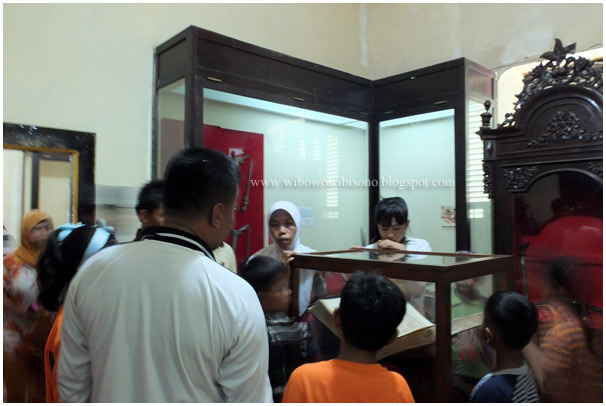 Despite my doubting her capability as a tour guide, Mbak Luna - her name – proofed that I was wrong as she seemed to master the history of Sumenep. She could professionally answer every little question I raised. 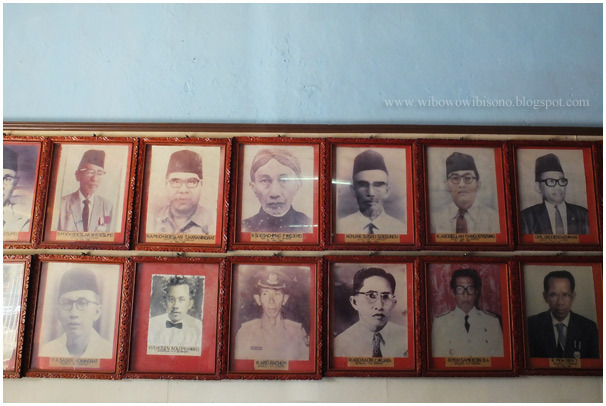 The first thing caught my eyes in the museum was the faded portraits of former regents of Sumenep. 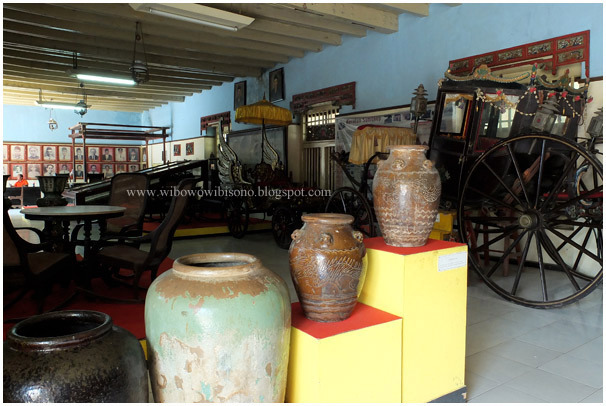 For a small regent like Sumenep, I wondered why they had some kind of old royal cart and Chinese jars and plates in the museum. Turned out that in the past, many foreign traders came and stay in there. They came for the salt. Apparently salt was a lucrative business in 18th – 19th century. 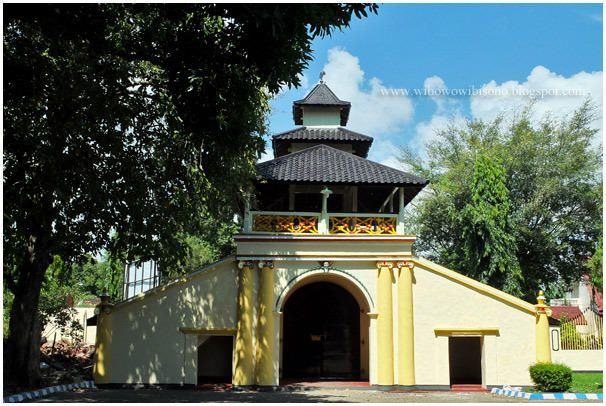 The royal cart was a present from a British trader for the sultan in exchange of salt concession in the east coast of Madura. 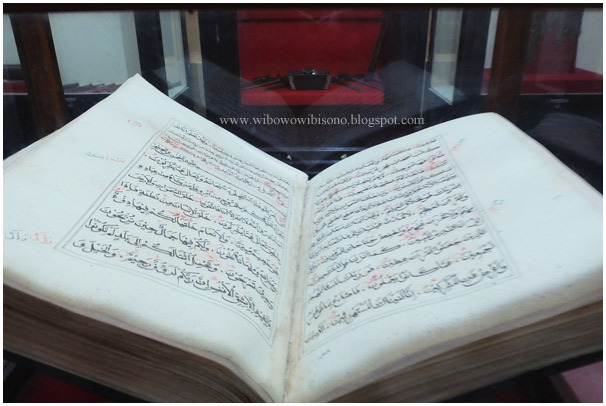 Another collection that attracted me in the museum was a huge manuscript of holy Quran. 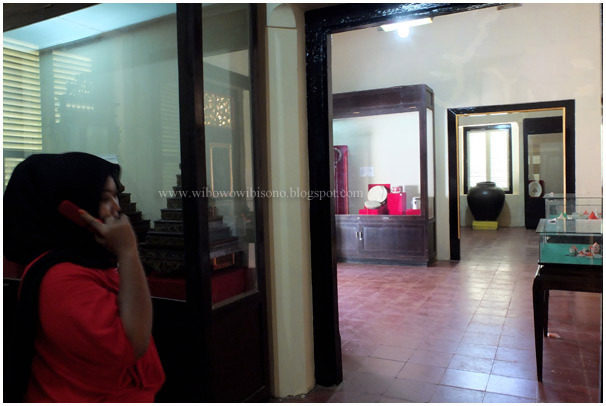 Mbak Luna brought us to the other part of the museum, the one located inside the palace complex. It occupied an old house built in colonial time. Before entering the house, visitors were advised to look at themselves in the big mirror put in the porch. “Everyone should dress up properly when entering the house,” said Mbak Luna. Nearly all the collections inside were the items of sultans’ family. 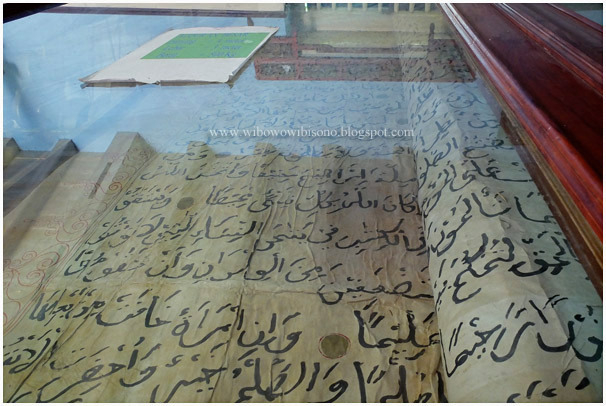 The most attractive object for local tourist was the handwritten holy Quran displayed in a glass box. It was like a manuscript written by one of the sultans of Sumenep. 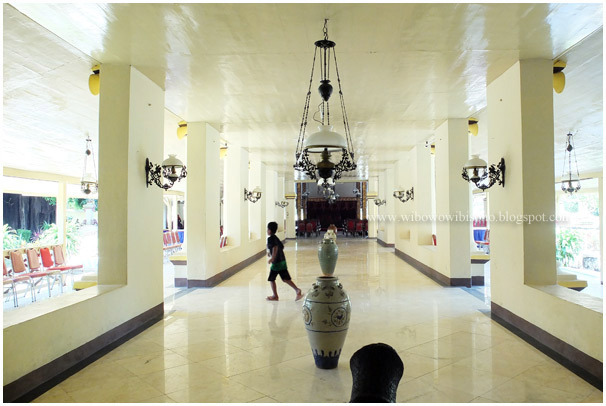 From Museum, we walked to the palace where there was a “Pendopo,” a grand meeting hall to receive guests, before moving to the former open bath for sultans’ family. In the past, while the women took a bath, the men would watch over them from a gazebo on the top of the main gate. 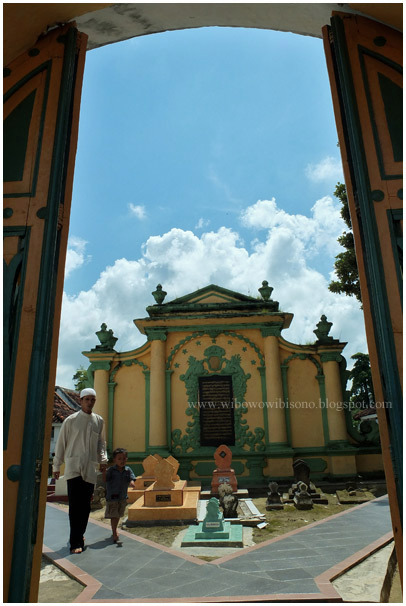 Another place in Sumenep I had had in mind for so long was the royal cemetery of Astana Tinggi. I was really stuck with the image of dome structure that seemed to be very much influenced by European architecture. At first I thought it was a mosque. Turned out it was some sort of mausoleum. That day, people came and gathered in it. They sent prayers led by an old man sitting close to the tomb. I had no idea whose tomb it was. 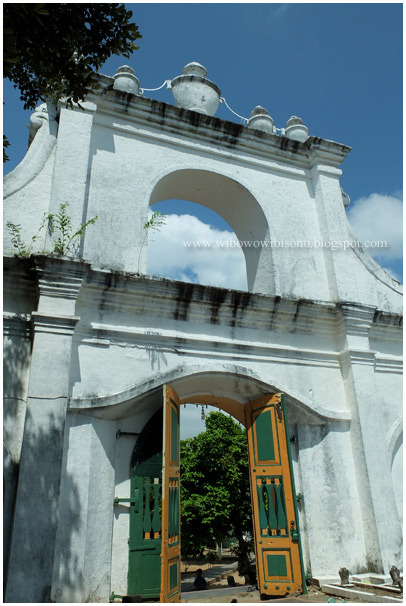 The cemetery, as it was named, was located high (bahasa: tinggi) on the hill. I could say it was the highest point of the island as we could watch over Madura from that place. 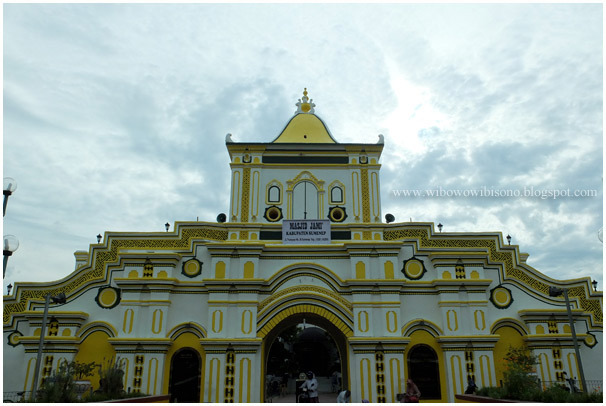 As for the main entrance gate, it really reminded me of the architecture of 16th century cathedrals built by Spain in its colonies. We didn’t stay long in this cemetery consider the heat and also we had to catch up the bus to Surabaya. We would like to spend the rest of the day in Surabaya before departing to Jakarta with a night flight. Soon after we paid for the rented car, the owner took us to the bus station where we got on board to an economic class bus to Surabaya. Departing at around twelve, we reached Surabaya at around five. We went to the old town for taking few pictures before taking another bus to the bus station of Bungur Asih. We had a quick dinner and took a bath at public toilet of the bus station. The water was brackish considering that it was only few kilometers away from the sea. We took the shuttle bus to the airport that departed every fifteen minutes. On the flight back to Jakarta I wonder if I would enjoy another getting lost in Madura. Calculating all the expenses and the time we had had for traveling this time, I didn’t think I would. I would return for the old town and the old port on that island one day. That time, I would come with a plan. Terima kasih buat kunjungannya gan. blusukannya keren mas . . .
Halo Kak Zulfa, terima kasih sudah mampir ke blog ini. Madura memang ternyata menarik untuk dieksplore. The thing about Sumenep is that it's really difficult to find place to eat. We found some places, though, not tasty, but decent enough to eat. 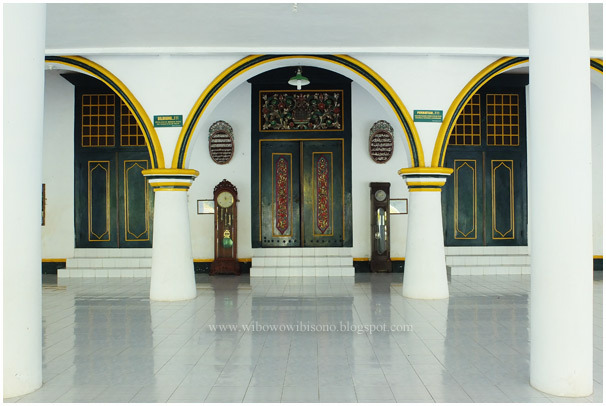 But I think Madura is worth it to visit. PS: reading your adventure reminds me of my time spent there years ago. That's why we had dinner in Surabaya. You've been there? what's the occasion? A friend wanted to try going to Kangean, and the only way to get to Kangean is through Sumenep. Too bad we couldn't stay in Kangean because we didn't have time (ship is once a day at night from Sumenep and afternoon from Kangean). So we went around Madura while waiting for the ship.